This is a good sign for those eager to get a PlayBook at a discounted price. 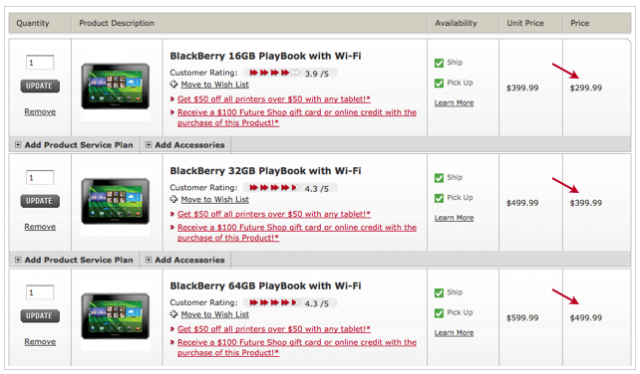 A week ago both Rogers and TELUS reduced the price of RIM’s first tablet, but it was only available to their employees. 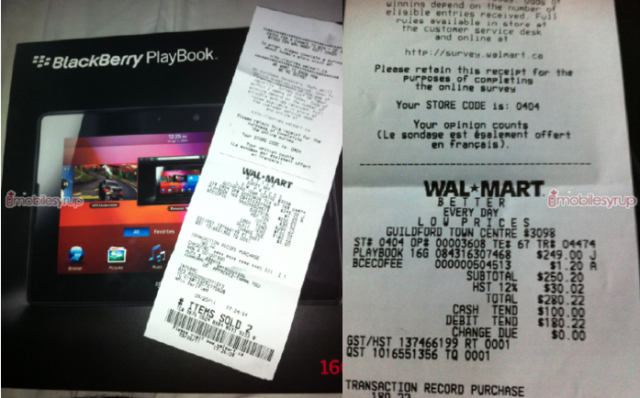 Checking out this receipt from Walmart Canada it looks like a massive sale is quietly happening. The price of the 16GB version has been slashed by a whopping 50% to $249 outright. Nothing is listed on the website but this is solid rollback pricing! Update: We’re hearing mixed pricing on the Walmart 16GB PlayBook, some are getting the discounted price and others are stuck at the $499 price. Not sure what’s happening there but some are getting a good deal. In addition, Future Shop and Best Buy have both lowered the 16GB price to $299.99. They have reduced the price by $100 and also extended a $100 gift card when you purchase online. As for the 32GB version, this now has been dropped to $399.99 and the 64GB falls to $499.99.